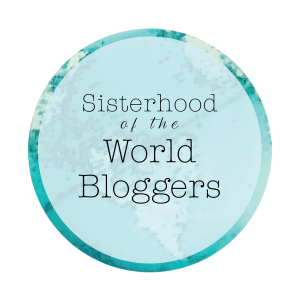 I am very pleased to have been nominated for the Sisterhood of the World Bloggers Award by susannevalenti and would like to thank you very much! Answer the ten questions you were given. 1. Do you have a TV series addiction and what is it? Absolutely! I love: Game of Thrones, Grey’s Anatomy, Bones, iZombie, etc. Not to mention shows that don’t air anymore like Avatar: The Last Airbender. At my house the TV is on pretty much all day. I can’t stand not having background noises and that’s why. 2. Which book character would you secretly like to marry? I have never thought about this…Well at least not for the last 4 years. I’ve always been in love with Fred and George, but I could never pick just one. And no, I’m not counting the fact that one is dead. And thinking back to all the books I’ve read, no one has really stood out. 3. What’s the most exciting thing happening to you this September? Well my husbands birthday is the 3rd. So that’s pretty exciting. We are also going to have huge pay checks this next month because he has been working almost 60-70 hour, if not more, weeks. I might get a tattoo, but I’m not to sure about that. 4. Are you a Christmas freak or a Scrooge? Is there something in the middle? Christmas just hasn’t felt like it should the last couple years, so that makes me mad. But I am going to spoil the hell out of my son this year of course. And we want to instill traditions for him as soon as possible. 5. Which book world do you really wish existed? The majority of people are going to say Harry Potter. And Hell. I am going to say it too. I would do anything to be a witch. 6. Which book series has you wishing for more? I am going to with The Queen of the Tearling series, and it’s not because the books feel like something is missing. It’s because I can’t have enough of it. It’s a great series. Granted I’m not yet done with the second book, and the 3rd isn’t even out. But, I just need it all. Everything that the author has thought of for it, I need to know. 7. Would you rather be a vampire of a wizard? Wizard. Hands down. No question. 8. Which magic power would you have? I saw a post on tumblr about the best power would be able to change probability. And that’s what I want. The chances that I will have x amount in my bank account is currently 0% (for example), but I change that to 100%. Yeah. The best power for sure. And it is a magic power. Because being able to change that stuff is certainly magic. 9. Happy ending or shocking twist? It depends. Is it a stand alone, or the last book in the series? Because please don’t put a twist there when there isn’t going to be any more books. I will personally find the author and kill them. 10. What’s the first thing you’d do if the dead started rising? Find my husband and his guns. Makes sure my family is safe. After that we can worry about other people and finding a safe place. 1. What are you reading right now, and how do you feel about it so far? 2. What is your favorite movie you have seen this year? 3. Which fictional character, TV, book or any other, do you think would be your best friend? 4. What do you like to eat/drink while reading? 5. Where do you typically read, and why is it that spot? 6. eReader or physical book, why? 7. What hobbies do you have other than reading? 8. What are the last 5 books you bought? 9. If you could only eat 3 things for the rest of your life, what would it be? 10. What is your favorite game to play, video or board game? This entry was posted in Book, Book Tag and tagged book, book tag, books, sisterhood of the world bloggers award, tag. Bookmark the permalink. Congratulations on your new award!